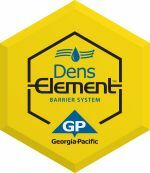 Introducing patent-pending DensElement™ Barrier System – the first and only premium water-resistive and air barrier (WRB-AB) system from Georgia-Pacific Gypsum. Leveraging industry-leading products from PROSOCO, we have revolutionized the way exterior walls are built. Scientifically enhanced, and tested for performance, the DensElement™ Barrier System combines the trusted performance of the highly recognizable GOLD Dens® brand with new AquaKOR™ Technology to transform the building envelope. 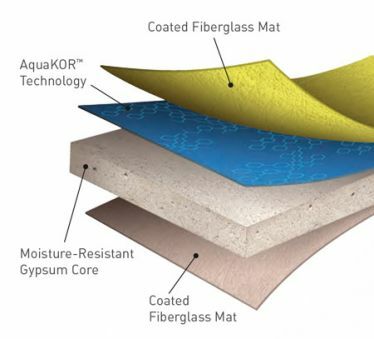 AquaKOR Technology integrates a water-resistive and air barrier within the sheathing’s gypsum core for “moisture forgiveness”. The barrier system resists water infiltration, but allows the wall to dry if and when moisture does penetrate. DensElement™ Barrier System eliminates the need for building wrap, fluid-applied or peel-and-stick membranes. The approved PROSOCO® R-Guard® FastFlash® liquid flashing completes the system by filling and sealing joints, fasteners, openings, penetrations and transitions. DensElement™ Barrier System saves time on installation as well as carrying a limited warranty. Learn more in the brochure below.